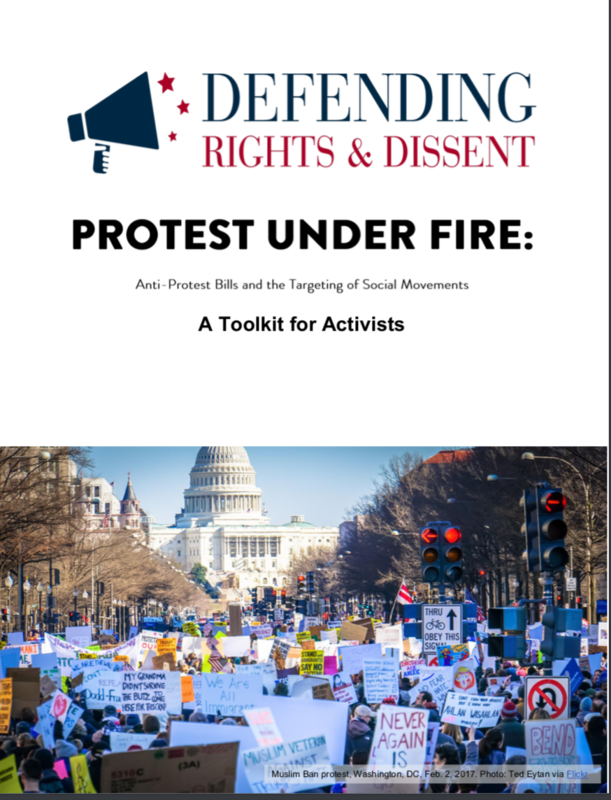 Defending Rights & Dissent presents a new series of toolkits to help activists fight anti-protest bills in their state. The new state legislative season is upon us and already over a dozen bills have been introduced across the country that assault the right to protest. New Jersey could start charging protesters with rioting and sentence them to five years in jail if another person at the protest damages property. Oklahoma could start charging stiff fees to protest at the state capitol. Missouri could start throwing anyone who engages in civil disobedience that impedes traffic in jail for 15 years. And a number of states are considering bills to create new or increased penalties for protesting near pipelines or on college campuses. We’ve been fighting back against this tidal wave of anti-protest bills for years. We work with grassroots activists on the ground and are leaders in a diverse coalition of national groups defending the right to protest. We’ve had victories and we’ve had defeats. Today, we’re launching a series of toolkits designed to help activists fight these bills wherever they may pop up. They’re based on our years of experience. They include background readings, fact sheets and talking points, sample letters to the editor and testimony, and even grassroots success stories. Defending Rights & Dissent has created three toolkits. I invite you to use them and share them with others. Protest Under Fire: Anti-Protest Bills and the Targeting of Social Movements deals with anti-protest bills broadly. It will help activists faced with everything from bills designed to create new penalties for blocking traffic to bills removing liability from drivers who hit protesters. Protest Under Fire: Critical Infrastructure Bills and the Targeting of Anti-Pipeline Protests will help activists who are fighting bills that create heightened penalties for protest at or near pipelines. They are pushed by industry groups and the notorious American Legislative Exchange Council and are clearly designed to silence the vibrant social movements opposing pipelines that have have gained strength across the country. Protest Under Fire: Anti-Boycott Bills and the Targeting of the Palestinian Solidarity Movement is a resource to defend the right to boycott. Anti-boycott bills single out supporters of Palestinian rights who boycott Israel to be uniquely penalized. The right to boycott is a fundamental First Amendment right and these bills are flagrantly unconstitutional. In addition to these toolkits, I would like to direct your attention to Defending Rights & Dissent’s new interactive resource hub. It allows you to filter through the vast array of resources on our website by subject, location, type of resource, or date. Anti-protest bills didn’t emerge in a vacuum. They are responses to successful social movements that challenge the status quo. In the past, we’ve seen anti-protest bills emerge as direct responses to Black Lives Matter, anti-pipeline, or campus protests. And with a new wave of teacher strikes and labor militancy, we can expect even more assaults on our right to protest.